Founded by a World War I veteran. Built for you. 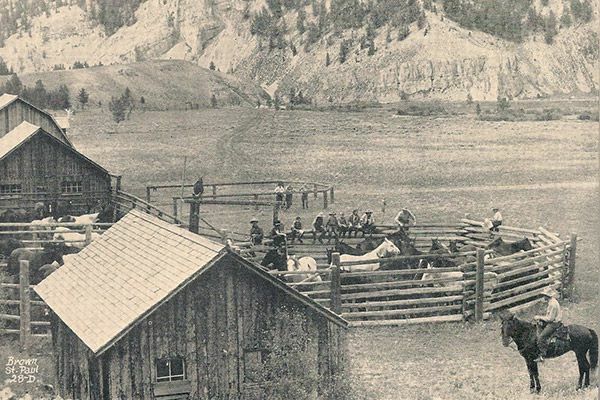 In 1922, an army veteran-turned-freight hauler retired his team and wagon to acquire a homestead on Sage Creek in the Gallatin Canyon with back taxes. That summer, he and his wife lived in a tent under the trees and built the first guest cabin with space for two couples out of logs and stone from the homestead itself. The bold move laid the foundation for one of the most authentic, genuine, and hospitable dude ranches in Montana, or anywhere for that matter. The U.S. Army released Ernest Miller at the end of World War I, where he established himself as one of the top marksmen in the country. After the war, he became a well-known big game hunter. During the summer, he got a job hauling freight by horse-drawn wagon between the railroad and West Yellowstone, just south of the current Elkhorn Ranch. On one of his freight trips, he met Grace, a minister’s daughter from Massachusetts who worked as the assistant to a professor at Montana State College in Bozeman. As newlyweds in 1922, they acquired the homestead on Sage Creek that would begin to form Elkhorn Ranch as it is today. The couple had a joint love of the outdoors and of people, making a dude ranch the perfect fit for them. While living in a tent their first summer, they began sharing their magnificent surroundings with guests from all over, infecting them with a love of the mountainous area. Over time, pack trips and day trips by car into Yellowstone National Park became high points for guests, who were usually more acquainted with closed-in eastern cities than Big Sky views. They built most of the ranch's log cabins in the 1930s with materials harvested from the homestead. By the 1940s, Elkhorn Ranch expanded to include two adjoining homesteads (Cow Camp and 7-11). During this era, the Millers moved the corrals and barn across Sage Creek to their current location across the meadow from the guest cabins. Though summer is mild and beautiful at Elkhorn Ranch, the winters can be brutal. Winter roads closed for months at a time, making it necessary to provide a milder location in the Madison Valley for wintering family, horses, and key crew members. Even that solution fell short. In 1946, Grace and Ernest opened a second Elkhorn Ranch in Arizona to provide a top-notch dude ranch experience year-round. The incredible country, coupled with the Millers' laid-back and inclusive demeanor, drew people back to the ranch year after year. In fact, many guests would plan to return at the same time as friends they met during their stays at the ranch. Among those returning guests were Minxie and Dwight Minton, both second-generation Elkhorn guests. The couple returned to Elkhorn Ranch annually for nearly 30 years and sent two of their three children to work on the ranch. The Mintons decided to purchase the Montana Elkhorn from the Miller-Hymas family in 1987. Since then, the Minton family has been dedicated to preserving the style and traditions of the ranch, showcasing its importance for generations of families like their own. Today the Elkhorn is managed by Linda Miller, Grace and Ernest’s granddaughter, and Jim McGuiness, the Elkhorn foreman. In 2016, the Elkhorn Ranch became listed on the National Register of Historic Places. "The ranch represents a stunning example of an intact, purpose-built, dude ranch dating from the height of the dude ranching industry in the western United States," the register says on its website. "Built in the rustic style with logs and stone sourced on the ranch these buildings have stood the test of time. 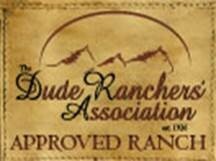 The ranch has continually operated since 1922 as a dude ranch with almost no changes to its physical plan or operations."